Apple [AAPL] has just launched the latest version of iOS 5 to developers. This time it’s iOS 5 GM that launches. We haven’t downloaded yet, but when installed we expect to see the final version that will launch next week. At this point the iOS 5 update is quite final although there’s a slim chance a small bug could find its way in there. 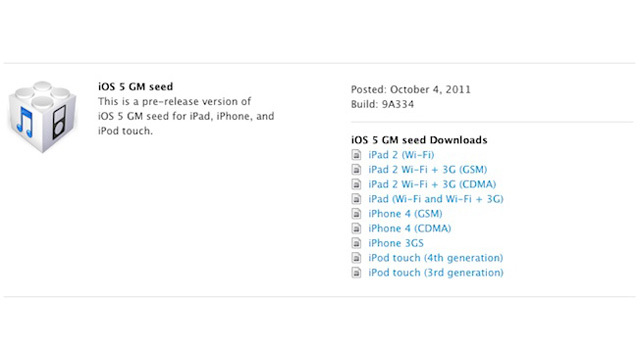 The iOS 5 GM update can be grabbed from your iOS developer account now. Just make sure you grab the correct version as there’s a CDMA and GSM version out there. For those wanting to update OTA, in some cases we’ve had to reset our device for the latest update to be recognised. We expect these kinds of problems will be ironed out in the GM release.